As soon as I got the new boxed game I knew I wanted to try out the gameplay itself. A lot of people are understandably excited about the miniatures, which I am too, but GW also produces some great board games. 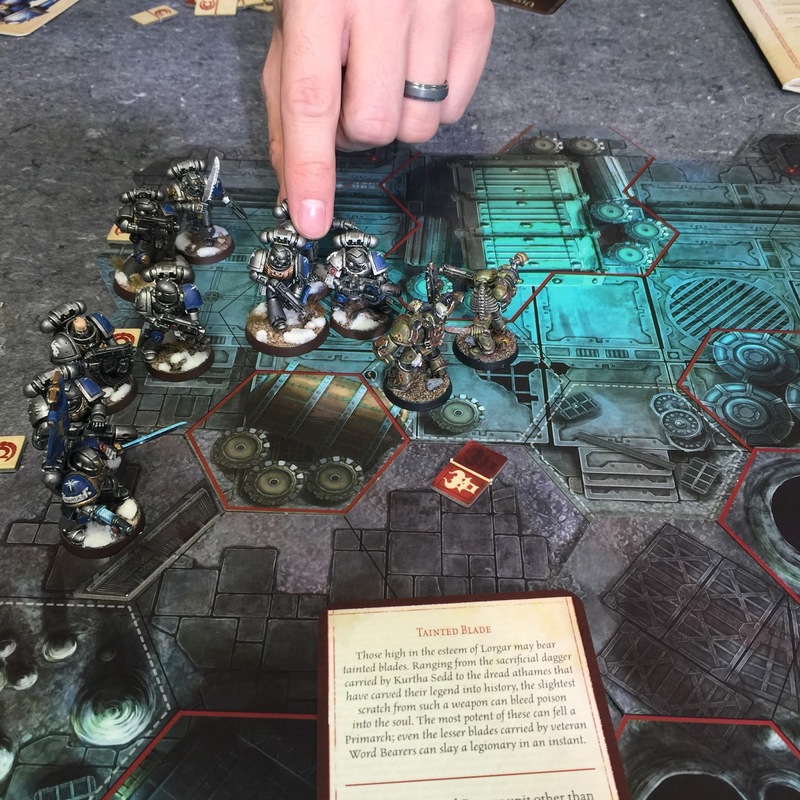 So with some proxy forces and my friend Adam in tow we played through the first two scenarios. Since I only had the game for four days at this point, I definitely didn't have all of the models put together. No worries though, since like many 40k veterans out there I had plenty of Space Marines from other armies. Instead of the Ultramarines fighting against the Word Bearers in the tunnels of Calth, we had the Astral Claws (pre-Badab War of course) duking it out with the vile Death Guard in a hive city of the 41st millennium. 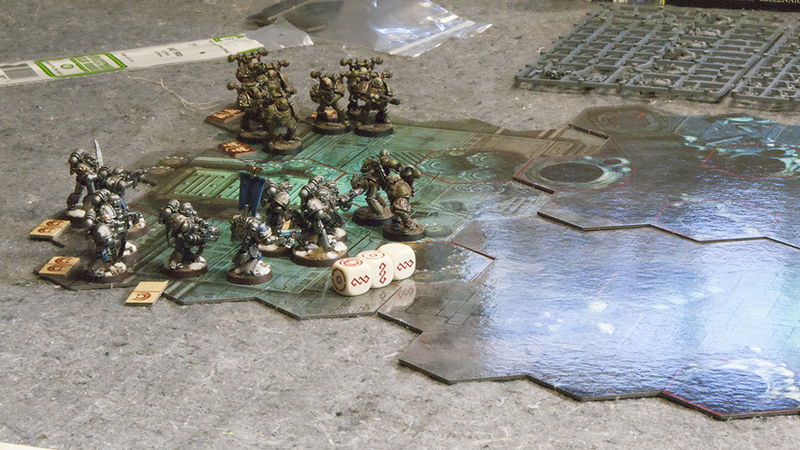 The first scenario sees a Veteran Tactical Squad from both forces racing against the clock to make it into the safety of the tunnels before the sun irradiates the planet's surface. 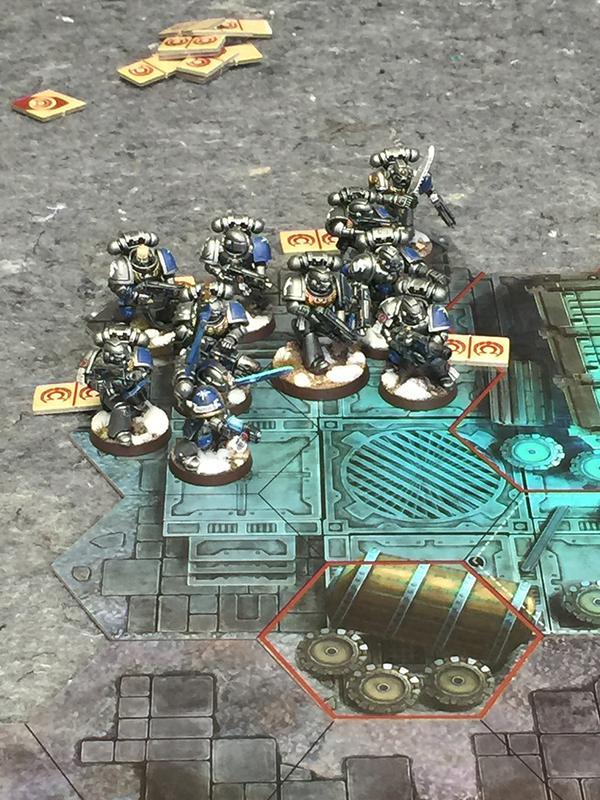 The winner is decided by whoever can get the most models off the far board edge through three different blast doors. Each of these blast doors closes at the end of a different turn, creating a real sense of urgency. It calls for 10 marines per side, with a Veteran Sergeant, and your choice of special and heavy weapons. We both took a melta gun as our special weapon since that's what the minis had modeled on them. I then proxied my multi-melta as a missile launcher and he had a plasma gunner stand in for a heavy bolter. Your other choices for special weapon would have been a plasma gun or a flamer. We also had our sergeants equipped how they were modeled which meant a power sword and plasma pistol for me, and a power fist and bolt pistol for him. After setting up the board and our forces in the way the scenario calls for we started with Adam getting the initiative since the "Chaos" forces get it automatically in the first round of this scenario. We each had a deck of six randomly chosen command cards, as well as one in our hand to start with. There are about 12 or so command cars per side, each of which has a unique ability that can swing the game in your favor when played. The Word Bearers' ones tend to be more aggressive and damaging, while the Ultramarines' cards were more defensive and tactical. This is pretty fitting when you think about the lore for each side. Each unit starts each turn with two Tactical Points. A unit is defined as however many marines are inside one hex. This can be anywhere from one to three tactical marines. Each hex can fit up to 3 "bulk points." A regular marine is Bulk one, a Terminator is Bulk two, and a Dreadnought is Bulk three. After we have both drawn our command card for the turn, he starts by choosing a unit to activate. Once activated the unit can perform up to as many actions as they have Tactical Points left. (I have now realized that each activation can only use one Tactical point at a time, but a unit can be activated as many times as they have points. This is not very clear in the rules unfortunately.) You can either Advance, Run, Shoot, Assault, or Consolidate. 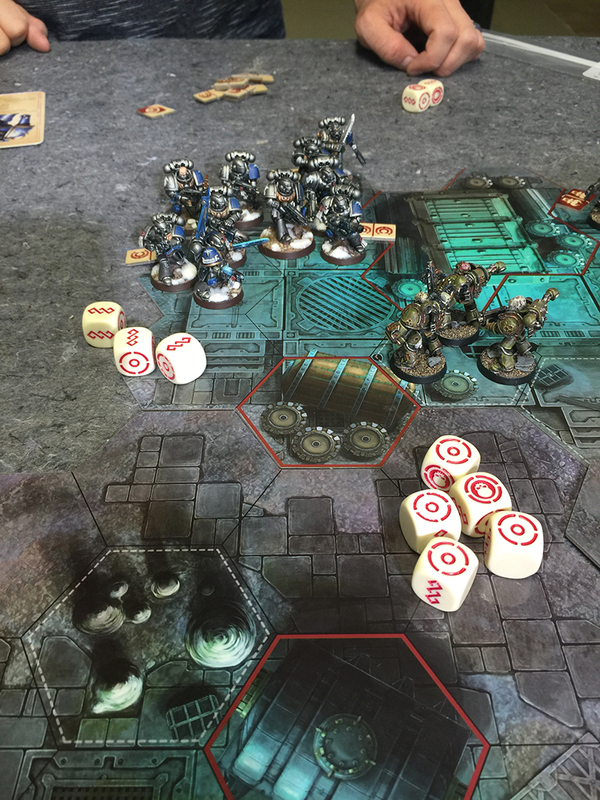 For his first unit he ran them over towards me, which allows them to move two hexes, and then for their second action he shot at the nearest unit. To shoot each weapon has a Shoot value. For a bolter it's two. This means he rolls two dice per bolter. When you roll the dice you can either get a Hit, Critical Hit, Shield or blank symbol. Shields and blanks mean you missed, where as Hit or Critical Hit are obviously hits. Critical Hits also unlock a special ability listed for each weapon. For a bolter this means the targeted unit loses one Tactical Point, which can be pretty harmful if they haven't activated yet. Next is rolling your armor and assessing the damage done to the unit. 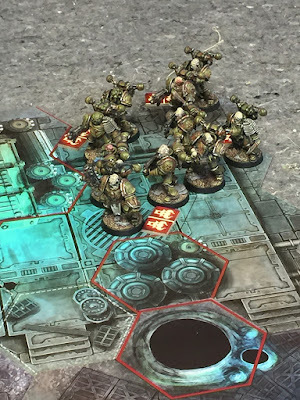 The Death Guard managed three hits against my unit. I pick a model in the unit, then roll my armor for that model first. Each model has an armor value, for a regular marine that's two, so I roll two dice. For each Shield rolled I remove one hit from his damage pile. So if I roll a blank and a shield that means one damage is removed from the pool, and the other goes through. Now you check your Stamina, which is essentially your wounds. A regular marine has Stamina two, so since there is still two damage dice left in his pool (he started with three, but the shield I rolled discarded one), the marine dies. Now, if he had only rolled two hits to start with and I still rolled one Shield, then only one damage would go through, which is not enough to kill my Stamina two marine. That damage is basically discarded since it won't carry over to the next action. So even though one damage got through to my marine, it's irrelevant after that point. If another unit wants to shoot at my guys he starts out at Stamina two again. If there is still damage left after a model is removed it moves onto the next model that you pick and you roll your armor again. Confused? It took us awhile to get a hold of and means you pretty much have to kill a marine in one action with overwhelming force or with a very deadly weapon. Some weapons' Critical effect, like melta weapons and power fists, treat the first targeted model as Armor zero, so you don't get the chance to roll any Shields. In that case they just have to try and roll enough hits to match, or beat your Stamina. Anyway, I got sidetracked there trying to describe the mechanics of the game. Honestly, you just need to play a game or two to get the hang of it and once you do it will all make sense. The game play is pretty tactical and really makes you think before you do anything. The command cards can create some pretty fun and tense moments as well. Near the end of the first scenario I drew a card that let me replace a models weapon with a Heavy Flamer. This was to represent my guys shooting at a Promethium Pipeline behind the enemy and blowing them up, and oh did it blow them up. If it wasn't for this I may still have lost the game. At that point he still had four models on the board, I had already gotten two off the far edge, but only had two guys left on the board. If he had been able to kill my remaining guy then there would be nothing to stop him from walking all four of his models off the board edge and winning the game. Luckily for me the explosion from the pipeline took out three Death Guard, ensuring a win for me. With a better understanding of the rules we decided to tackle the second scenario which sees the Ultramarine player controlling five Terminators and Captain Aetheon, with the Word Bearers still just controlling one Tactical Squad. The Loyalist forces are split, with the Captain and two Terminators starting on one end of the board, and the remaining three on the opposite side. The three not with the captain cannot make any moves until turn three though, this is to represent them still being unsure about firing upon brother Space Marines. Man oh man are Terminators tough to kill. They have Stamina three and an Armor of five. 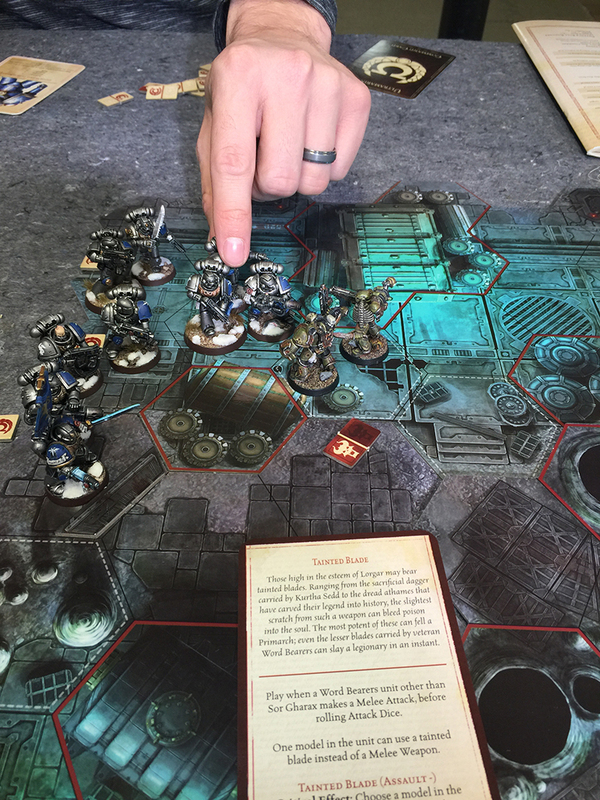 You can really only kill them with some very, very lucky bolter rolls or with specialist weapons that ignore armor. In fact not a single Terminator died during the game. My captain did die at one point, but when the characters die for the first time in a game, instead of removing them you just flip their card over to use their wounded stats. These are essentially the same, but my captains ability changed. Originally he got two extra attacks for charging but after he's wounded his ability becomes a buff for adjacent friendly units. This may seem like an unfair game, but it relies on the Traitors delaying me and denying me movement. I have to reach a computer console in the middle of the board, and only have five turns to do so. I also have to have a tactical point left on my captain to activate the console. I pretty much decimated his forces, but in the end I lost the game. 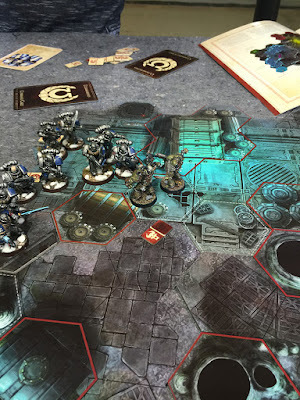 This is due to Adam camping a unit out on the hex with the console and constantly Consolidating smaller units into the larger one as it suffered casualties. My captain was all ready to move into the hex on turn four and win the game when a bolter scored a critical hit on him, knocking off one of his Tactical Points. This means he would only have enough Tactical Points to move into the hex, and nothing else. At the start of turn five the game ended with only three traitors left alive. Both of these scenarios were pretty fun, fast, and kind of tactically unforgiving. I mean that in the best way too. I love when the GW board games require a lot of thought and if you make a wrong move it's very hard to recover from. It really embodies what I imagine two Marine forces duking it out would be like. They are both forces of the most highly trained killers in the universe with the ability to think thousands of moves ahead. Certain parts of the rules were a little hard to grasp at first and really required us playing through it to fully understand them. Once you have a firm handle on those rules they are pretty simple and easy to remember, allowing you to focus on the decisions you are making in game. I love the element that the command cards bring to the game, and playing one of them at the right moment can really swing the game. I'm itching to play through the remaining scenarios and get to try out all of the units available. This game is definitely a fun break from the typical GW games and would be a great addition to anyone's board game rotation. I would say that you could play through one of the scenarios in under an hour, so it won't take the whole night either. There are a few rules that could have been written clearer and fixed with just two extra lines (Any wounds to Stamina suffered during an Action that were not enough to kill the model do NOT carry over into subsequent actions. Each new action see the Stamina reset to its full value if the model was not removed.) All in all though I enjoyed it a lot and it's a fun, quick game to accompany the models that most people are probably buying this box for. I also want to thank my friend Adam for taking pictures throughout the game, all of the close up shots are his.